Our bodies wear down with time, just like cars and about everything else in life. This is also the case for implants. 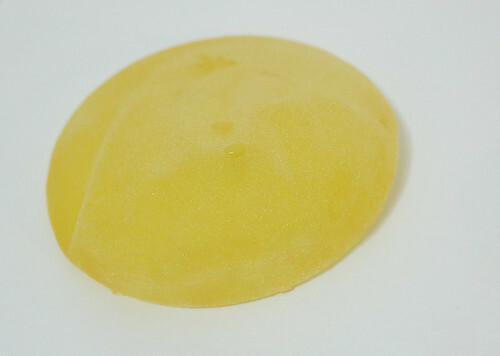 The rupture of breast implants can occur any time after the initial breast augmentation. EVEN IF NO TRAUMA was caused to the implant, it can still rupture. 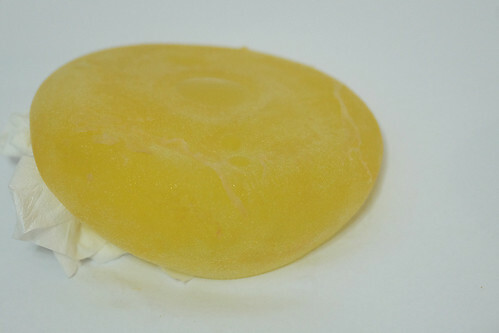 Even the pressure from a mammogram can cause the breast implants to rupture. The reason of the rupture is due to the failure of the implant shell. 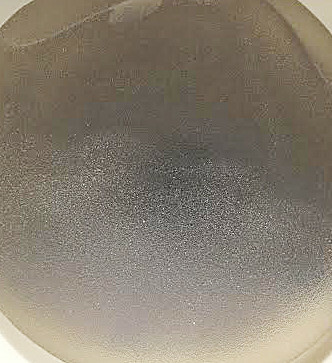 As implants age, the shell becomes softer and more worn, and over time, this may result in a break in the shell and the leakage of its contents. 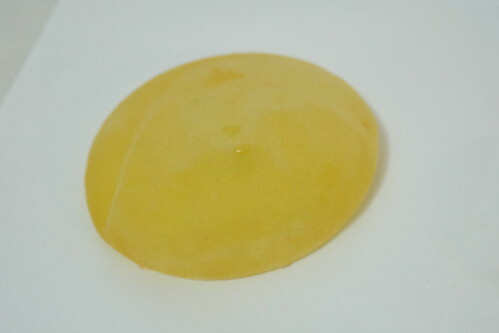 Breast Implants are not lifetime devices, they typically only last 10-15 years. As mentioned below, my rupture is very minimal only a very very small hairline tear. This post is not sponsored and written on my own accord. Its main purpose is to serve as a reminder to relevant parties that they have to carry out regular checks on their implants, as ruptures are more common than one thinks. Ruptures are not only caused by trauma or accidents, but wear down over time and do not last forever. I also hope that sharing my experience would provide those contemplating surgeries a better understanding of what to take note of of before, during and after the procedure(s). This is a difficult post for me to write as I say good bye to my chin implant and breast implants. 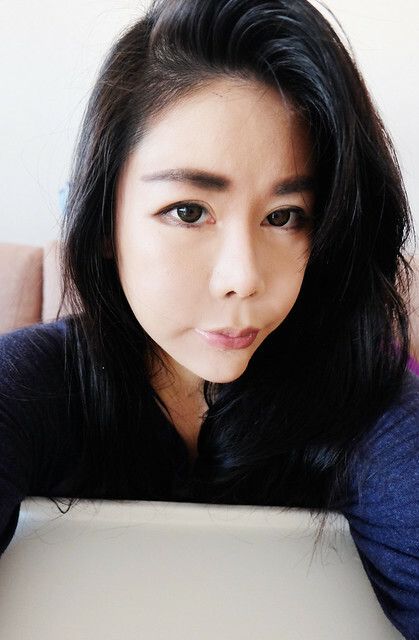 I had my chin implant done in South Korea 5 years ago. I had chosen gore tex implants for my chin then. I had my breast implants done in Singapore 6/7 years ago by a very famous local plastic surgeon. Let's start with the story about my breast implants. Last year in October 2015, I felt that there were lumps in my breast. I got worried and went for a check-up with my gynaecologist in Europe. Upon examination, she said she did not think it was anything serious, but referred me to a radiologist to get an ultrasound done just to be on the safe side. Both the radiologist and my gynaecologist knew that I have breast implants. What does the breast ultrasound do? A breast ultrasound uses sound waves to make a picture of the tissues inside the breast. According to the radiologist, a breast ultrasound is able to show all areas of the breast including the areas close to the chest wall. The radiologist applied some gel over my chest area and then a small handheld unit called a transducer camera was moved over my breasts. The ultrasound scan showed that both my breast implants were ruptured. The radiologist broke the bad news to me and advised me to talk to a plastic surgeon with my ultrasound results. My husband and I were very worried. 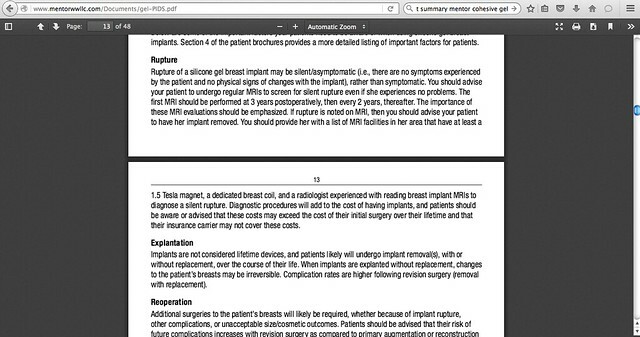 I searched frantically online to understand more about ruptured breast implants. I was actually thinking of replacing my breast implants with new implants. But then I came across this facebook page : Breast Implant Illness and Healing Official Group during my search online. I read about other ladies' experiences, and some of them got very ill after 20 years with their breast implants. 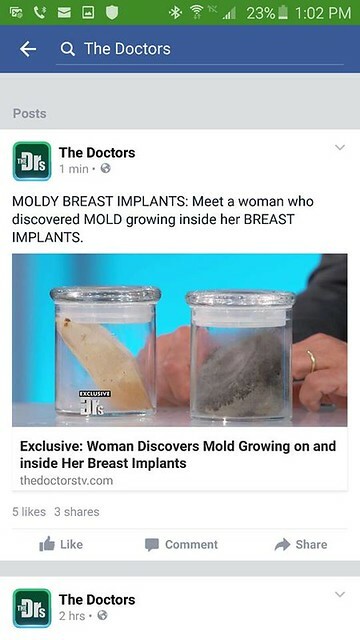 Someone in the facebook group : Breast Implant Illness and Healing Official Group shared this screenshot. 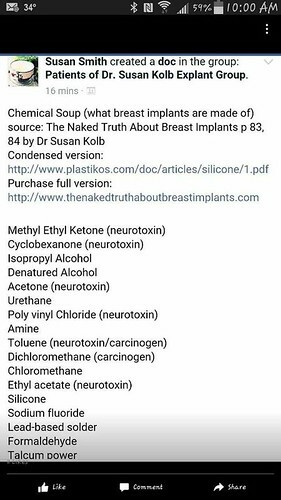 It shows the ingredients used to make breast implants. They do not last. They rupture. And the longer they’re in the body the more likely they are to rupture. The statistics are kind of scary, because around about 50 percent are ruptured by 10 years. And when it gets to 15 to 20 years you’re looking at almost 90 percent of implants that are ruptured. 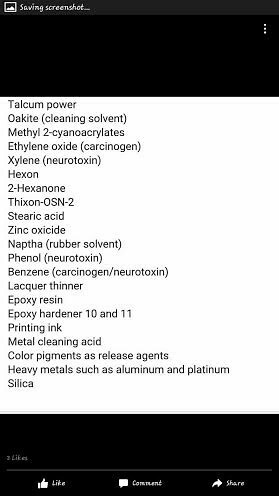 What is most worrisome is that while most of the silicone is contained within the capsule, some of it leaks out, we don’t know where it goes, we don’t know what it does, we have no idea. 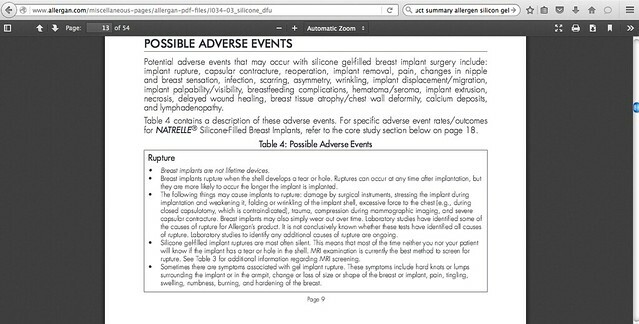 AS QUOTED FROM THE ALLERGEN PRODUCT SUMMARY : "BREAST IMPLANTS ARE NOT LIFETIME DEVICES........"
"Rupture of a silicone gel breast implant may be silent/asymptomatic (i.e., there are no symptoms experienced by the patient and no physical signs of changes with the implant), rather than symptomatic. You should advise your patient to undergo regular MRIs to screen for silent rupture even if she experiences no problems. The first MRI should be performed at 3 years postoperatively, then every 2 years, thereafter." Honestly speaking, I do not have any issues with my breast implants. They did not make me sick YET! They were 320cc Allergen silicon gel textured implants and they were teardrop shaped. 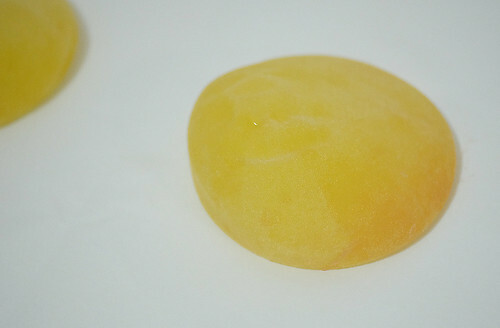 I had my breast implants done under muscle and the scar was minimal. I only have praises for the plastic surgeon who did my breast augmentation in Singapore 6/7 years ago. I took good care of my implants, I was careful with them for the time they were in me. BUT MY BREAST IMPLANTS RUPTURED even though I took such good care of them. I felt a sense of shock, disbelief, and disappointment. The plastic surgeon who did my breast augmentation did tell me that the breast implants typically lasted 10 years.While this also meant that I had to get them changed every decade, 10 years seemed like a long time to me back then. Moreover, my implants were only 6 / 7 years old. The news of their rupture was all the more harder to stomach. I went to a plastic surgeon in Europe with my ultrasound results and sought his opinion. He was professional and very reassuring. He told me that it was possible to remove the ruptured implants and replace them with new ones. To aid my recovery after the operation, I had to rest and not carry my son for at least 1-2 weeks. However, as I had no help with taking care of my son during the day, I could not afford the 1-2 weeks down time. The ultrasound also showed that the rupture was contained in the capsule, which meant that no silicon had leaked into my body. When I expressed my concerns regarding the repercussions to my health with the rupture, the plastic surgeon in Europe reiterated several times that the silicon gel implants were safe EVEN WHEN RUPTURED. All this time, my breasts were still in perfect shape. Even thought they were ruptured, the shape was still intact. At the same session with the plastic surgeon in Europe, I asked him about my chin implant. My chin implant had been giving me problems for a few months. My son kept knocking into my chin implant when carrying him, causing much pain. The plastic surgeon said that my chin implant looked like it was out of shape. I felt the same too! While my chin looked different from back when I first had the implants, I wasn’t sure if the change was due to infection or any other medical reasons. The plastic surgeon said that he could do a replacement of the chin implant too. Before the ultrasound, we had already booked our winter holiday to Rovaniemi, Finland. We were going to see Santa Claus!!!!!!!! We had been looking forward to the trip but my husband was very worried about me. The plastic surgeon told us that we can still go ahead and that I would be fine. I thought about it for a week and decided that to go ahead with the explant for the sake of my long term health. I also decided to do the operation in Singapore. With my family helping to look after my son, I did not need to take care of all his daily necessities myself and could concentrate more on my recovery. I decided that I would REMOVE both my breast implants and chin implant. I emailed the plastic surgeon in Singapore and also called the clinic. I made an appointment with them and then booked our air tickets to fly back to Singapore. I flew back alone with my son after our Rovaniemi, Finland holiday. My husband was very sad to see us leave. He had to work and was not able to get leave. I reassured him that I just needed to handle the flight back to Singapore. Once we landed in Singapore, my family would be there to help me. At the first consultation with the plastic surgeon in Singapore, I asked him about the removal of my breast implants and chin implant. He told me that the chin implant looked like it had an infection, and that he could remove both the implants together. I also pointed to him the swelling in my nose, which he said he could remove it within the same operation as well. He said the operation would take 3 hours. Everything would be done under sedation and local anesthesia. So we made an appointment for the surgery. I knew I was in good hands as I felt very comfortable with the plastic surgeon and his team. One week before the operation date, I went to The Clifford Clinic to have my face lasered and prepared. 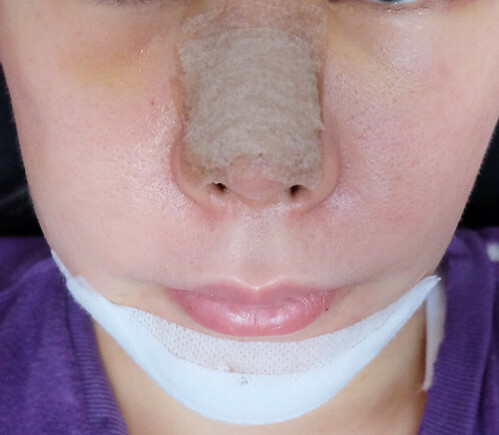 I wanted to have good skin before the operation. My chin area was prone to outbreaks while we were in Europe, and I was always puzzled as to why only the chin area was affected. Now it made sense with the plastic surgeon’s diagnosis of the infection of my chin implants. 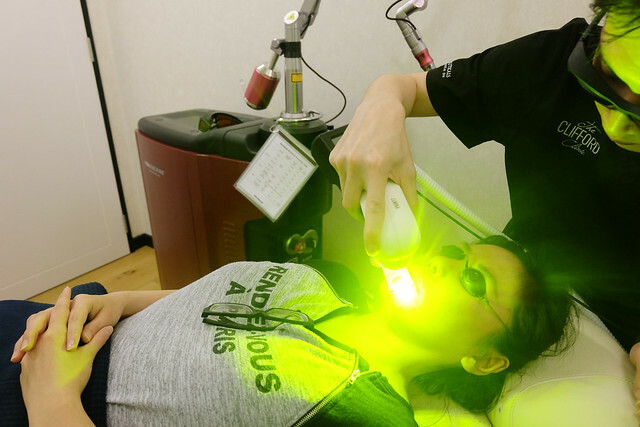 I had CO2 laser done on my cheeks, nose and forehead and I had DUAL yellow laser and Q-switch laser done on my chin area. My son insisted that he had to stick to me while I had CO2 laser done. Dr Ee lasered my face. This treatment is called the Dual Yellow. 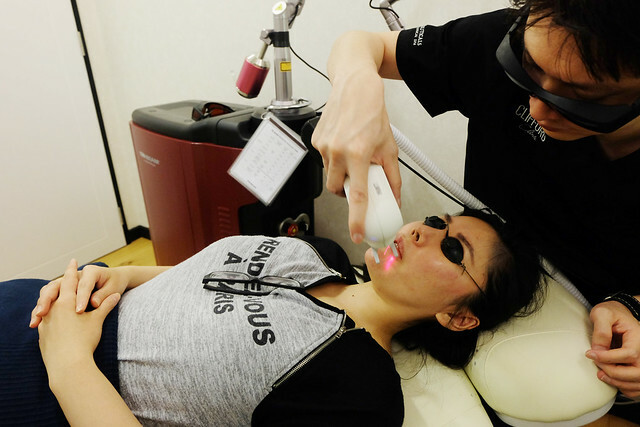 Dual Yellow laser can be used to treat scars and stretch-marks. 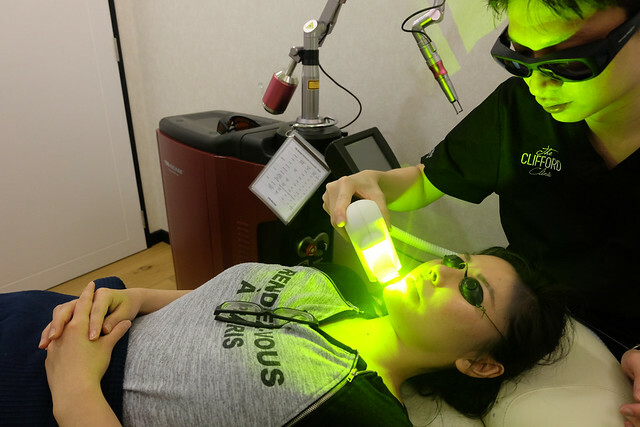 The yellow light from the Dual Yellow laser is a painless procedure and helps to generate collagen, the essential protein for giving your skin elasticity. This happens because yellow light affects the collagen in a way that promotes regrowth; it also reduces pigmentation. So your skin will appear lightened, and more youthful. Dr Gerard Ee then did a Q switch laser for me. Photo taken after I recovered from the laser sessions at THE CLIFFORD CLINIC. This would be the last photo taken with my chin implants. I was very nervous. It was a stressful time for me as I had to say goodbye to the body and face I had grown accustomed to. My family accompanied me to the clinic and waited for me while the operation went on. A final consultation was conducted by the plastic surgeon before the nurses prepared me for the surgery. I was asked to change into the operation gown and to lie on the operating bed. The plastic surgeon reassured me that I was in good hands. The anaesthesiologist came in and shortly after, the sedation kicked in and I fell asleep. When I woke up, the doctor was finishing the operation on my chin. There was no pain and I could only feel a bit of tugging. He told me that my chin implant was badly infected and that there was some fluid in the chin area which had to be extracted. He confirmed that the operations were a success and I did not have to worry. I was moved to the resting area where I rested for about an hour. The nurses brought the implants in and asked if I would like to keep them. I replied in the affirmative. After a while, I told the nurses that I felt well enough to leave. I left the clinic after collecting my medicine: sineech (deswelling medicine), arcoxia (painkillers) and antibiotics. p/s : My skin was irritated from the chemicals used to prep my skin for surgery. When the breast implants came out of my body they were yellow. The rupture was very minimal. I am glad that the rupture was not major. In addition, no leakage was found. 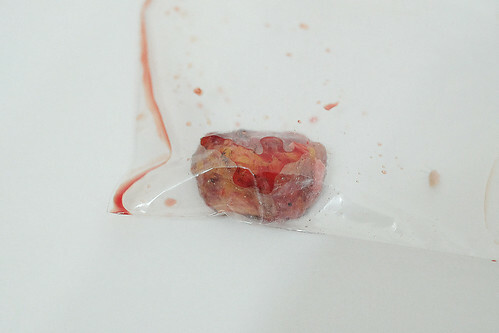 Here is a picture of my infected chin implant. 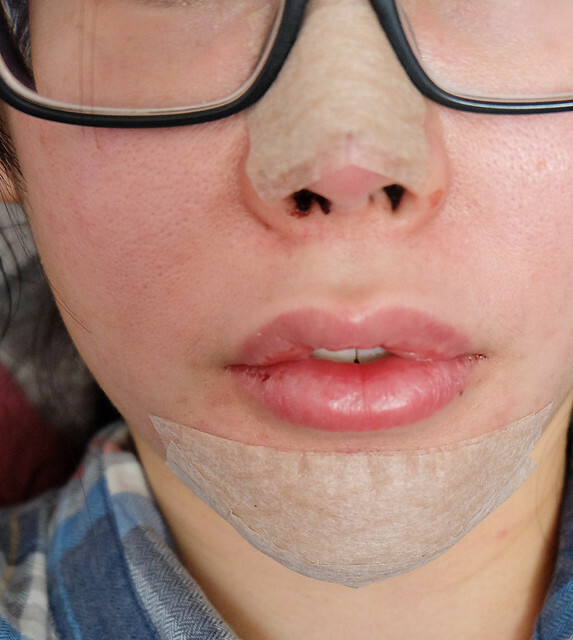 and upon removal of the chin implant, my acne is totally gone from my chin! I only have scars to deal with now. I can no longer remember how my breasts looked like before the implants. While it looks a bit deflated now, there are no stretch marks on my breast area. The scars under my breast are recovering well. I regretted getting the implants as they were short lived. They do not last a lifetime. My word of advice is to maintain your breast implants by taking good care of them and going for regular check-ups to identify ruptures early. 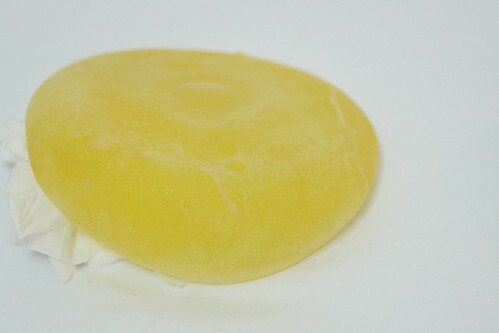 Due to wear and tear, ruptures in breast implants are very common. I am happier with my current chin, it looks better without the implants. There is some internal scar tissue which helps to offset my protruding mouth. 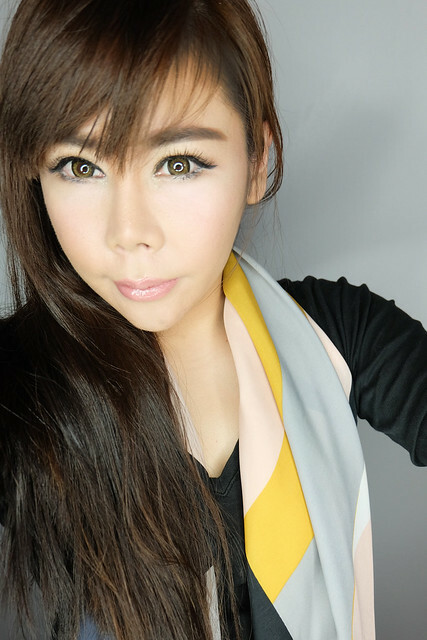 The result of my chin explant makes my face appear sharper and smaller than before. Photos taken a few days ago. 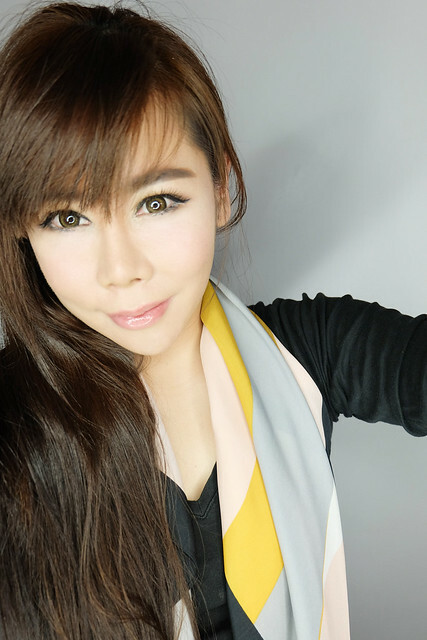 In this post, I have shared my experience in mitigating the long term effects of cosmetic surgeries, which for my case was an issue to be dealt with over time. I hope that this will serve as a point of reference for those contemplating surgeries, and as a timely reminder for those who have already undergone the surgeries to take care of yourself and go for regular check-ups to ensure that everything is in order. I am glad that I chose my current plastic surgeon. He is very experienced and is based in Singapore. He has done a fantastic surgery for me. Throughout this explant journey, he has been very helpful and patient. He took time to explain the surgeries to me and made me feel at ease. Disclaimer: Ultimately, the decision to go for surgeries is the sole decision of each individual. There is no right or wrong on the issue of the interpretation of our individual identity and what we stand for. I fully respect the decision of each individual to do the necessary in order for them to feel confident and comfortable in their skins. For me personally, looking back, I probably would have told my younger self to give more consideration to the long term health implications of the surgeries before undergoing them. Hi Jacqueline, u look even prettier now. Would u mind sharing which plastic surgeon did the explant for u? I am considering to get my removed too. How long did it take u to recover from the explant? Your own natural tissue and cartilage are a better option than an artificial implant. I have friends that had many complications arise with artificial implants eg. rejection / infection / asymmetry problems. My current nose is with ear cartilage nose tip and Bridge with about 2cm silicon. That is the last bit of implants left in my body. From what I understand this should last forever. BUT the natural aging process may affect the shape and size of the nose.